After we ran our feature on the 15th anniversary of the launch of Windows 95 this morning, we exchanged a few emails with Brad Silverberg, the senior Microsoft engineer who ran the team who built the product. Brad's at Ignition Partners now, but obviously he remembers the Win 95 launch well. Brad spoke at the Win 95 launch event ("Jeez—was I nervous!"). You can see the video here. Brad especially remembers the closing moment of the event, when the stage opened up to reveal the Win 95 development team, who then received a standing ovation from the crowd (see the end of the video here). Watching the video and listening to Brad's memories, it's no wonder Microsoft was so successful. We should all be so lucky as to work on a team that is this passionate about what they have made. Thanks, Henry. This brings back lots of great memories. Win 95 was a perfect storm where the product and marketing came together at just the right time, and obviously resonated with the general public, not just the techie industry. It was an experience everyone on the team will never forget, and tell their grandkids about (and for some of us, that's not too far off). it was cool traveling the following months for various worldwide launch events and see people all over the world talking about Win 95 and even better, running it on their pc's. A few days after the launch, my family and I got away to a remote place in eastern Washington to a guest ranch. I figured after all the intensity and non stop media coverage, I could get away to some rural, no-tech place and chill. Wrong! Even in the boondocks, people were abuzz about Win 95. I was on an airplane a week or so after the launch, and someone in the row across from me was running Win 95 on his laptop. His neighbors peeked over to see Win 95. They ooh'd and ahh'd, and next thing I know, the laptop is being passed around the cabin so people can see it. In September I was in Stuttgart about to fly to Munich for the German launch. I was in the security line at the airport. And in Germany, the people at the scanner were not the TSA types we have here, but rather, trim German soldiers in uniform and carrying automatic weapons — fierce looking guys. One asked me to open my laptop and start it up. 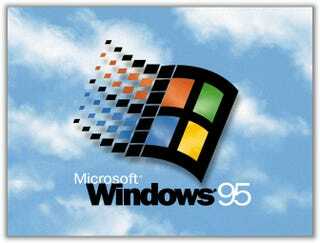 When the splash screen came up with Win 95, he broke out into a big smile and said, "Ach, Windows Funf und Neunzig! Go right on through!!" What an incredible feeling to see people all over the world, of all shapes, colors, ages, social classes, and occupations — not just white collar knowledge workers, but everday people, blue collar, kids, grandmas — running our software. That was our vision when we started the project, and to see it come true, was amazing. (One of the goals for Win95 was to get localized versions out an order of magnitude faster than ever before. The initial launch was in 8 languages simultaneously, and the hard ones, like Japanese, were only 90 days later — vs. over a year later for Win 3.1. The localization effort was one of those Big Hairy Audacious Goals that people think you're crazy for attempting, but the team got inspired and succeeded).